Ghost Recon: Future Soldier, Ubisoft's new third-person sneaky shooter, comes out tomorrow. But for those eager to dive into stealth shooting action, the tie-in Facebook game, Ghost Recon: Commander, is available now. 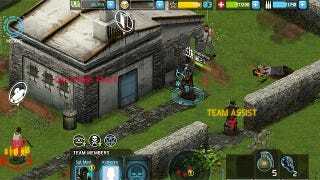 The game starts out like many Facebook games, introducing the player to their base, which the player builds up over time purchasing items from the in-game shop using currency earned from missions. Missions, in this case, involve infiltrating areas and shooting the people in them—alike in concept to a console Ghost Recon game, if not in appearance. Ghost Recon Commander also encourages players actually to work together, not just to siphon each other's earned goodies, by allowing a player to invite friends as allies on a mission. There, you and a buddy can merrily shoot merceneries and henchmen together. And if you don't have friends who are playing, NPC buddies will join you on missions for a small in-game-currency fee. If you just want 3D, stealthy, multiplayer Ghost Recon action, wait until tomorrow. But if a bit of quick grenade-tossing team play is up your alley, and you want some new appearance options for your guns in the console game, a quick jaunt through the isometric jungles of Facebook can't hurt.